Boil the spaghetti squash whole until soft (i.e. easily pierced by a knife), remove from water and let cool. Meanwhile, sautee mushrooms in earth balance until soft, then add soy sauce and balsalmic vinegar. Sautee 1 more minute then transfer to a bowl to cool. When squash is cool enough to handle, slice in half (do this over the sink or you may get a hot waterfall surprise!) and scrape out seeds, retaining the stringy part of the squash. Use a fork and scrape out the “spaghetti” strands into a large bowl. Mix the sugar, salt, and rice vinegar together and toss with the squash. Set aside. Heat a shallow sautee pan and fill with about 1 inch of water. When the water begins to steam, turn the heat down to as low as possible. You want the water to be hot, but cool enough to place your hands in. Clear your counter and have all your ingredients ready: bowl of crushed pistachios, washed arugula, bowl of sauteed mushrooms, bowl of spaghetti squash. Place one of the spring roll wrappers in the hot water to soften, about 30 seconds. Remove from water and place in front of you. Add about two tablespoons of squash, mushrooms, and arugula. Sprinkle with nuts and fold closed. Repeat. Wisk first five ingredients together until sugar dissolves. Place in serving bowls and add pistachio nuts for garnish. Spend dinner trying to figure out what to do with the leftover spaghetti squash. This looks great! I love Spaghetti Squash. My family loves to eat it with mayo and saysauce and a bit of chilly powdwer. Ooh, interesting! Thanks for the tip, I’ve never heard of it prepared that way! That is from my grand pearents. All of my relatives love to eat Spagetti Squash this way only. Oooo, I’ve been looking for a homemade dipping sauce. My favorite spring roll is with a piece of romaine, some fresh mango, sticky rice and some avocado. Yum. I can’t wait to try it this way:) Thanks for the recipe. 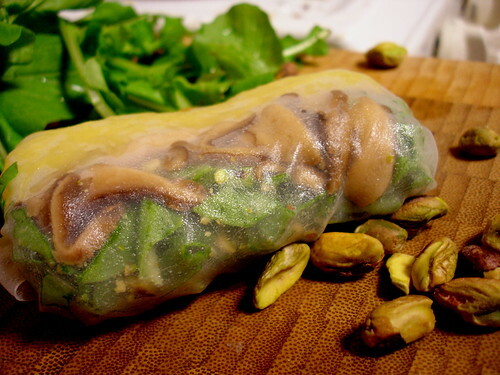 I love the idea of putting pistachios in – can’t wait to try this! you mention blending the salt sugar and vinegar with the squash… but you don’t have sugar listed in the ingredients, how much sugar should you use? How long should a spaghetti squash be cooked in a pressure cooker? I boiled mine tonight in the only pot that would fit it: my pressure cooker. It was taking so long that I finally put the lid on. I was afraid to overcook it, so I didn’t really let it get up to full pressure. My guess is that if you brought it up to pressure, then let it come down naturally, it would be done.